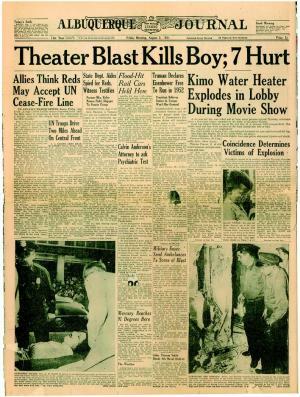 Thursday afternoon, Aug. 2, 1951, there was a water heater explosion in the lobby. At least seven people were injured, some very seriously. A young boy perished as a result of his injuries. Over the years the theatre staff have come to realize that if the performers in a show do not leave a gift of some sort that odd things will go wrong with the show, various April Fools/practical joke sorts of things. So we keep a place for them to leave gifts; toys, pictures, doughnuts, candy, etc. ... and their shows seem to go much smoother.